Spotted the Hitachi no. 178M-T-105M-36M-T-37M at Flinders Street Station today to ran 15.26 Down Cranbourne today. 197M and co were sighted running an UP service (ex Pakenham) at Dandenong at 2.35pm. 57M and co were sighted running a DOWN Lilydale service between Flinders Street and Richmond at 3.33pm. Unknown Hitachi stabled at Westall this evening, and 46M and co were stabled at Dandenong this evening. 88M-1982T-65M-22M-1975T-46M ran the 08:21 down service at Windsor, and the return at 09:02, and 37M-1979T-36M-105M-1999T-178M ran down empty cars at approx 09:05. Unidentified DOWN Hitachi ran express through Carnegie at 9.03am. 197M and co were stabled at Westall this afternoon. Only spotted three cars of this set in the yards. I assume the other 3 are inside for Maintenance. Spotted 57M-1922T-184M - 179M-1977T-129M stabled at Epping this morning. Location: Socialist People's Republic of Yarra. 10M-1909T-21M-49M-1987T-196M is currently running the 17:20 down Upfield. Should be arriving at Upfield in about two minutes. Why are the stripes lower? IIRC Bayside trains had lower stripes. I am not sure when (or if) the Hitachi's will get Connex livery. 10M & co was spotted running empty cars from Flinders Street across the viaduct at 19:45 tonight. Location: Eaglemont, Hursty line, Melbourne. I'm guessing that was the Hitachi that pulled into Jolimont on yesterday's Ch10 News report about the 30 new trains. 88M and co ran the 13:32 DOWN Sandrigham this afternoon. Flagstaff is closed on weekends - maybe you mean Parliament? Nah, you were that person caught in the loop the other day. The lowered stripe on 144M is from the Bayside days - the trains used to have a large B on the front with BAYSIDE TRAINS written where the usual stripes were. The Bayside stuff was ripped off (just like the EDI Comeng sets before their Connex livery was added), but the Met stripes weren't moved at all. 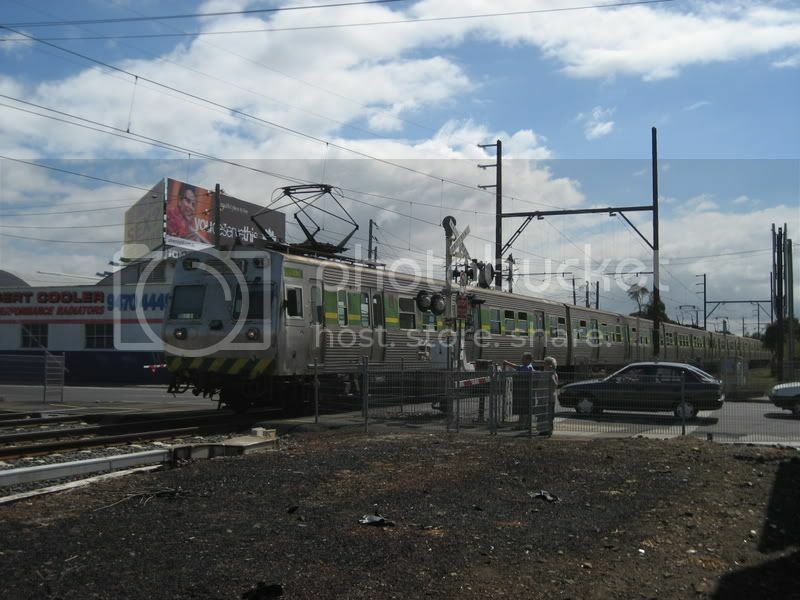 A bit late, but one of the non D-car (driving tralier) sets went across the Caulfield Viaduct yesterday at about 15:00. My contacts in the field reported some Hitachi Activity this evening at Southern Cross. Both sightings at around 17:45. 10M and co sighted leaving platform 11 heading back to Flinders Street, with 88M heading a consist leaving Platform 12 towards North Melbourne. 197M trailed the 07.03 up Frankston this morning, groaning under the increased load since the 06.52 failed to run. With sticking doors and a couple of false starts (power cut-outs under load) we were probably lucky we had a determined driver. 178M formed the back end of the 17.17 down Nexasandringham tonight. 23M and co passed up through Burnley at 1635 this arvo. Didn't see any pax on board. 37M and co sighted running a DOWN Pakenham service at Hallam at 8.13am. Caught the 8:40 DOWN ex Mentone to Frankston today. I am confused though because Gwiwer claims the 06:52 UP City Loop didn't run yet this normally forms the 08:05 DOWN Frankston which ran, as a hitachi however was about 7 minutes late.